Besides being used as motor contactor, this type of high voltage DC contactors can also be used in many other areas. It is also widely used on uninterruptible power supplies (UPS) and other electronic control systems. As one of the best electrical contactor suppliers in China, we always aim for the highest quality standards. All of these top quality contactors are available to the international clients outside China at the most competitive prices. 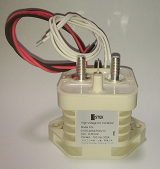 Want to know the price or technical details of this high voltage motor contactor series? Just contact us now. Epoxy sealed vacuum chamber and inside filled with inert gas, the well protected contacts plus magnetic blowouts for electric arc elimination are some of the outstanding features. 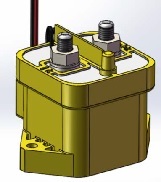 Thus make it possible for the vacuum contactor to break (cut off) the high voltage load up to 900VDC. With rated voltage ranging from 12Vdc to 900Vdc, this electrical contactor can cover the entire range without the need of multiple versions. With the vacuumed contact chamber filled with inert gas and the adoption of non-arc structure, it makes possible to have very small contact gap while maintaining safe and efficient DC breaking. As the result of this optimal structure, comparing to other type of contactors – this electrical contactor is very quiet even when it breaks high current. The DC contactor’s safety and reliability are ensured by the fact that the contact is sealed inside the chamber filled with inert gas. The arc has no way out which makes it very safe to operate. The consistent contact resistance makes it perform reliably regardless of the environment changes. 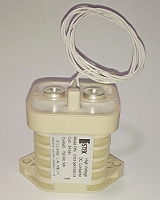 Some of the high voltage DC contactors can be made with non-polarized contacts which makes the wiring connections more flexible and much easier. With the light moveable part, big counter force and less impact of gravity, the electrical contactors can be easily installed with side or bottom mounting options. These powerful high voltage DC contactors can be used for many different relay switching purposes, they include: motor contactor, battery switching and backup equipment, power control of DC voltage and circuit safety protection, etc.. 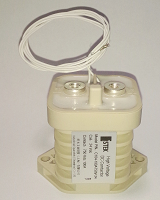 These high voltage electrical contactor products are in compliance with EU RoHS directive - 2002/95/EC. Relying on the optimally controlled production cost, this high voltage series product for motor contactor and other purposes offers the most competitive price in the current markets while maintaining the highest quality level. Want to know the price and availability of this DC contactor? Please contact us now. Using coil economizer, ISTEK-C105 200A 750V series of DC contactors consume 5 times less power than conventional contactors. The holding power is merely 1.7W at 12Vdc while the reversing EMF is kept at zero volts. Type D has 1A form of auxiliary contacts; ISTEK-C105 200A 750V-D model effectively lowers the coil current after the contacts are closed – saves energy and reduces coil heat. Type E is a non-polarized model; the non-polarized contacts for ISTEK-C105 200A 750V-E make it much easier for wiring connections. The connection to the contacts can be made in any order or any direction – no need to worry about positive or negative side. 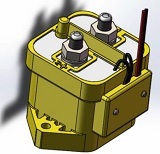 Typical EV applications: Charging for Electric Car Batteries besides often used as motor contactor for DC control. For more technical details on this vacuum contactor and its life performances on electric car charger, refer to the product datasheet ISTEK-C105-200A-750V-DC-Contactor. Want to know the price of this 900VDC contactor? Just contact us now. For more technical details about this vacuumed high voltage DC contactor which is ideal for battery charger and as motor contactor, please refer to the detailed product datasheet of ISTEK-C104-100A-750V-DC-Contactor. This model of electrical contactor is often used for battery charger, circuit protection, lighting control and motor contactor. For more technical details about this high voltage DC contactor or vacuum contactor, just ask us for the product datasheet of ISTEK-C103-50A-750V. Want to find out the best price and availability for any high voltage DC contactor? Just contact us now. Alternatively you may ask us for more information on any of these products - being for battery charger, motor contactor or electric car charging. Our technical team will work closely with you and find a solution to properly address your requirements on electrical contactor products.